No, not that kind of leek, this kind of leek. 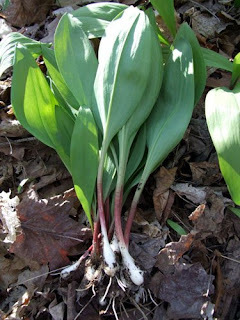 In the grocery store they're called ramps, but in field guides they're called Wild Leeks, or Allium tricoccum. A wild relative of cultivated leeks, onions, shallots, garlic, and chives, they look like a flamboyant green onion once you dig them up. They sort of taste like it, too. This was my first year harvesting them, and in the past I'd been warned over and over to be careful, that they are very pungent, that a little goes a long way, and so on. Maybe they get stronger as they age, but the ones I picked had a flavor like a very mild onion with just a little bit of garlicky bite. 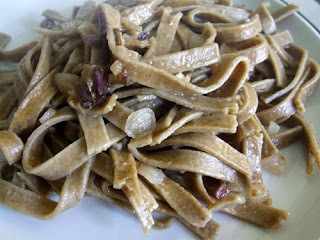 Euell Gibbons, the patron saint of foraging, says that they are "the sweetest and best of the wild onions," and although I haven't had other kinds of wild onions, I would tend to agree. 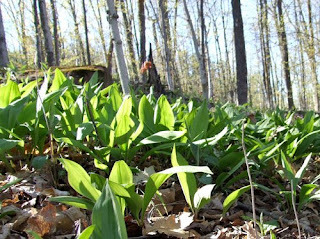 Wild leeks are a great introduction to foraging because they are so easy to identify—your nose will tell you if you've found an allium family plant. The leaves come out in the early spring, followed by a single umbel of white flowers later in the summer after the leaves disappear. They grow shady, semi-moist forests, and a lot of what I've read says that they like a rich or sandy soil, but I pulled mine out of thick clay that didn't want to give anything up. I hadn't brought a spade or anything, I was just digging around with a stick and my fingers. This was four days ago; my hands are still dirty. 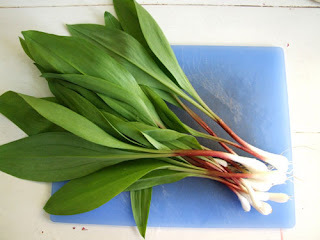 But look how pretty the leeks are once they're cleaned up. I harvested seventeen bulbs, ranging in size from finger wide to pencil thin. They cleaned up very quickly—the tough outer skin rubbed off easily under running water. I only used the white bulb and red-purple stem, although the leaves are also edible (I tried one raw; it was tender and mild and had only the very slightest hint of onion—they would probably be a good addition to a tossed green salad) and sautéed them in a couple tablespoons of salted butter until they were just starting to caramelize, then served them with tomato-basil fettuccine. Cooked this way, the leeks were amazing, but the recipe needed more of them. I'm going to try to get back out and pick more leeks this week, and I might continue on through the summer to see how the flavor changes. But this time I'm picking more than seventeen, and this time I'm bringing a spade. They *are* delicious! I like them a lot, and ya gotta figure that every garden plant today originally started out as something wild and scraggly growing in the woods or prairie.